Arriving into Moscow on June 6 in their pareu wear, the children immediately hit the spotlight with all the media, and although overwhelmed, they handled themselves well. It was the opportunity of a lifetime for these two youngsters, who joined children from 211 countries and participated in the three-day International Friendship Camp, held at the Spartak Football Academy. The event centred around teaching the nine values of the programme: friendship, equality, fairness, health, peace, devotion, victory, traditions and honour, while also learning the roles of the journalist, players and coaches. 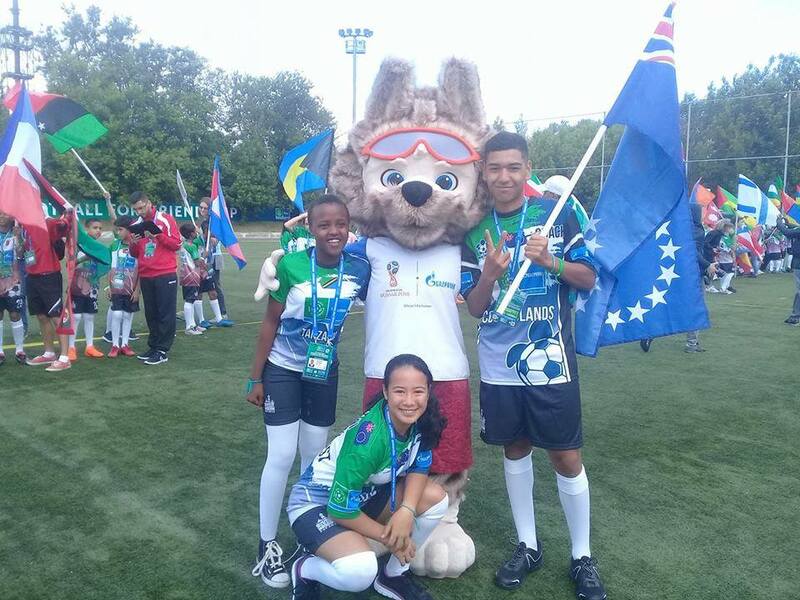 Tuaratini, the young journalist, took part in the Football for Friendship International Press Centre, preparing the daily Football for Friendship newspaper and reporting on daily events at the camp, World Championship and Children’s Forum. Ngamata, the young coach, worked on preparing his young team, made up of players from six different countries, with the ultimate goal of winning the Football for Friendship World Championship. The Football for Friendship World Championship took place at the Sapsan Arena on the fourth day, with individual skills and power displayed by some of the 12-year-old players at another level to that seen in the Cook Islands. Ngamata’s Big Turtle team played well and made their way through pool play, winning their games against Lemurs 1-0, Woodpeckers 4-1 and Siberian Tigers 3-0. The Big Turtles team topped their pool and made it to the quarter finals, before losing their final match 0-2 to the Komodo Dragon team who eventually lost in the finals to the Chimpanzees. All teams were named after endangered animals and children were also taught about this during the camp. The Children’s Forum was held the following day. This was an official event held at the Moskvarium. Before the main event everyone had the opportunity to see the marine life including whales, dolphins, turtles, stingrays and fish. Guest speakers and motivational speakers inspired the children and special awards were presented for the values programme, journalists, players and the world championships. The day finished with spectacular sea lion and whale show. The highlight of the trip was attending the opening game of the FIFA Men’s World Cup between Russia and Saudi Arabia on June 14 at Luzhniki Stadium in Moscow, with 78,000 other people. Ngamata was selected to be a flagbearer with fellow players and coaches from the 211 countries who lined the stairways of the stands. They waved high their countries’ flags during the opening ceremony when singer Robbie Williams performed. Both Ngamata and Tuaratini got involved in every opportunity they could, making many new friendships, including those from the Pacific, and they were great ambassadors for our tiny nation, said Paiti. “My journey to Russia was an amazing experience, I feel blessed and lucky as a child to have the opportunity to travel to the other side of the world and see things not many other children could see,” Ngamata said. “It was very exciting being a part of this event as I got to make good friendships and create bonds with children from countries like Serbia, Tanzania, Rwanda, Somalia, Samoa, Tonga, Solomon Islands and Trinidad and Tobago. Tuaratini said her experience in Russia was a first of a kind. “We had a lot of fun, all the kids from different countries have their own unique way of showing their culture. I meet so many kids from different countries but my favourite was Samoa; everyone showed you a lot of respect,” she said. The delegation is extremely grateful for this amazing opportunity and thank the Cook Islands Football Association, the parents for their support, Bishop Paul Donoghue for the special prayers and the CITC supermarket staff for their kind donation towards our trip. CIFA acknowledges Kevin Milstein from the Reagan Milstein Foundation and Roxanne Strass from the Lengo Football Academy for their hard work and assistance with the applications, along with the Gazprom Football for Friendship International Social programme which supported the massive increase of country attendance from 64 last year, to 211 this year, allowing the Pacific nations to become involved.